Google+ Hangouts™ can help you build brands, shorten sales cycles, improve customer service, train staff, align employees behind strategy, and a whole lot more. You name it, someone’s doing it successfully with Hangouts. 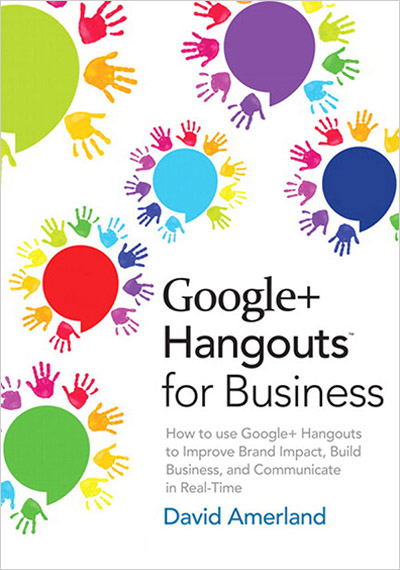 You can, too–and Google+ Hangouts for Business will show you how. The book completely demystifies Hangouts: the hands-on tools, best-practice techniques, opportunities, even the etiquette. It reveals exactly how to profit from Hangouts, even if you have absolutely no video or business social networking experience. You’ll discover why Hangouts isn't “just another” video or conferencing technology–and why the difference makes it so valuable to your business. Whatever your business, this quick and easy guide will help you build powerful new connections within your company, with your best customers and prospects–with everyone you need to reach. Hangouts On Air (HOAs) have been one of Google's most disruptive technologies. Introduced quietly, they have become the only viable shortcut to increasing brand equity, fashioning an identity and establishing trust and authority. For some of the Hangouts I have taken part in check out the Video section of this site. The eBook version of this book is available for Android Tablets and phones, Nook format (from Barnes & Noble) and Kindle from Amazon. If you buy from Amazon but do not have a Kindle, Amazon handily supplies a cloud player where you can read the eBooks you purchase. Most, but not all, of my books, can be signed electronically. If you would like a personalized autograph, from me, point your browser at Authorgraph, pick the title you want and send in a request.